Dang! Ashiok is hosing Modern real hard. Exiles graveyards which all the top decks are abusing right now (Dredge, Phoenix, etc) and the static ability turns off fetchlands. A bonus game with Frenzied Affinity, and we're matched up against Waste Not - a deck very similar to 8-Rack. 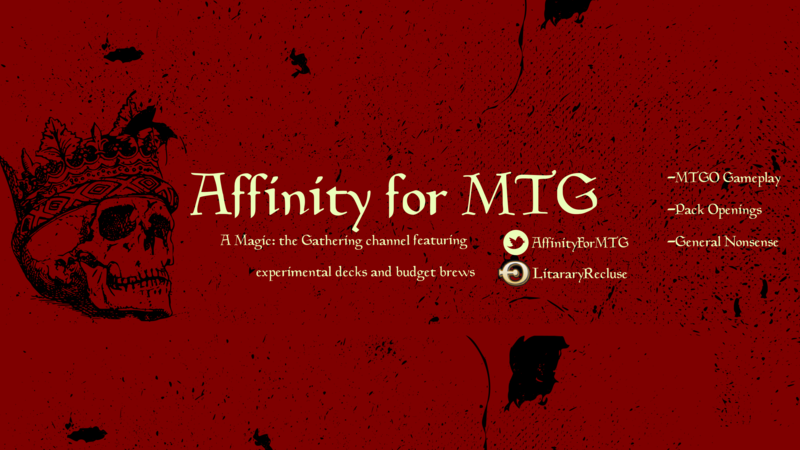 -------------------------------------------- For the longest time Affinity was one of the fastest decks in modern, capable of winning the game in the first few turns. However, the deck has always been incredibly vulnerable to sideboard hate and board sweepers. Now, we finally have a solution - Experimental Frenzy! That's right, a 4-mana do-nothing enchantment might be the card that saves traditional Affinity from languishing in the lower tiers of competitive play that it has found itself in. Let's give this deck a try and see how it feels! -------------------------------------------- Frenzied Affinity decklist: https://www.youtube.com/playlist?list=PLZX5Ly_QRoO0cMFVu3LNd2Rxpr0sOc5fY Subscribe: https://www.youtube.com/c/AffinityforMTG?sub_confirmation=1 Twitter: https://twitter.com/AffinityForMTG Outro: Jahoda by Djjaner -------------------------------------------- Background music provided by Kevin MacLeod (incompetech.com) Licensed under Creative Commons: By Attribution 3.0 License http://creativecommons.org/licenses/by/3.0/ This video is unofficial Fan Content permitted under the Fan Content Policy. Not approved/endorsed by Wizards. Portions of the materials used are property of Wizards of the Coast. ©Wizards of the Coast LLC. It looks like the dead Gods of Amonkhet are, indeed, eternals now! I hope they get individual cards, that'd be pretty cool, but we have this for now: Bontu and Kefnet are depicted in the art. I present to you, literally the most degenerate deck to ever win the World Championship. Not even joking, deck is nuts! Hey guys! I'm thinking about doing an on-going series in which I offer in-depth decks techs for previous world championship-winning decks. I have a bad habit of starting a series and then never finishing them, but when I do finally decide to film one I'll be posting it here. In 2006, Makihito Mihara won the Magic: the Gathering World Championship with this deck, Dragon Storm! The name pretty much says it all, it's a legitimate UR storm deck...with Dragons!Check it out! -------------------------------------------- More World Champion Deck Techs: https://www.youtube.com/playlist?list=PLZX5Ly_QRoO3OgvYT4dInht5B0DRw5qLQ Subscribe: https://www.youtube.com/c/AffinityforMTG?sub_confirmation=1 Twitter: https://twitter.com/AffinityForMTG Outro: Jahoda by Djjaner -------------------------------------------- Background music provided by Kevin MacLeod (incompetech.com) Licensed under Creative Commons: By Attribution 3.0 License http://creativecommons.org/licenses/by/3.0/ This video is unofficial Fan Content permitted under the Fan Content Policy. Not approved/endorsed by Wizards. Portions of the materials used are property of Wizards of the Coast. ©Wizards of the Coast LLC. Challenger decks are back!! These are powerful Standard decks ready to be played straight out of the box at your local Friday Night Magic or Standard Showdown tournament. You can literally buy one of these at your local gaming store and compete that very day - and still be competitive! If you're interested in these decks, but don't know which deck is right for you, then you're at the right place! In this video, we're going to take a look at all four Challenger Decks and go over how they work, so you can decide which deck is right for your play style! FULL DECKLISTS: https://magic.wizards.com/en/articles/archive/feature/challenger-decks-2019-03-18 -------------------------------------------- Subscribe: https://www.youtube.com/c/AffinityforMTG?sub_confirmation=1 Twitter: https://twitter.com/AffinityForMTG Outro: Jahoda by Djjaner -------------------------------------------- Background music provided by Kevin MacLeod (incompetech.com) Licensed under Creative Commons: By Attribution 3.0 License http://creativecommons.org/licenses/by/3.0/ This video is unofficial Fan Content permitted under the Fan Content Policy. Not approved/endorsed by Wizards. Portions of the materials used are property of Wizards of the Coast. ©Wizards of the Coast LLC.